Die Hard instructs the soldiers accompanying him to back off as he wishes to face SuperPatriot on his own due to him being his friend. He tries to reason with the brain-washed hero but the Covenant of the Sword are watching on through the artificial eyes of their pawn. They increase his aggression levels which results in SuperPatriot blasting Die Hard in half. He then proceeds to massacre every single one of the soldiers present. A second Die Hard is activated within the Pentagon and he ignores warnings from the scientists in the sub-basement that he is occupying a prototype unit that has yet to be fully tested. 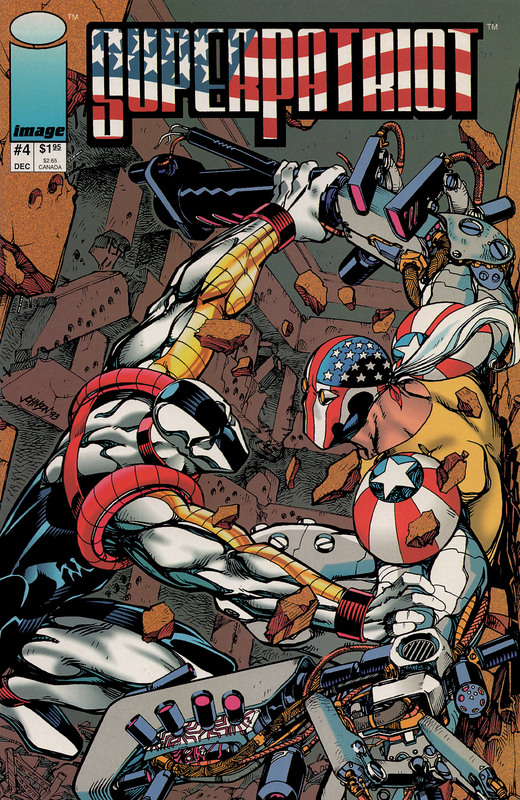 SuperPatriot is struck from behind by his old friend as Die Hard steps up his attempts to liberate the mind of his opponent. Other members of Youngblood are present but they refuse to join the fray out of respect of Die Hard’s request and ignore the orders of Jake Farrell to intervene. SuperPatriot manages to gun down his foe and Die Hard momentarily seems to be defeated but he soon recovers and launches a large piece of debris. The evacuation of the Pentagon is completed but Shaft still refuses to get involved, grounding Badrock who is eager for some action. Die Hard continues to attack and manages to tear off one of SuperPatriot’s arms. This enables him to then remove SuperPatriot’s mask and pin him down in front of a piece of shiny metal. In an effort to reach SuperPatriot’s mind, Die Hard continually tells him that he is not a machine but a human being. As these words are repeated, SuperPatriot gradually starts to see his reflection as his various different guises. He eventually regains full mental control and surrenders to Die Hard, finally ending the violence. This mission’s failure causes the Council member who concocted the plan to be executed for her failure. Sometime later, SuperPatriot is fully restored and is checked over at Hillman Hospital by medical staff that includes Ann Stevens. He grows tired of various tests and checks himself out before Jake Farrell stops by for a visit. He does his best to recruit SuperPatriot to rejoin the government and tries to justify his actions regarding using him as a weapon. Jake is ignored completely and SuperPatriot departs to try and make a new life for himself. As he drinks coffee at a diner, SuperPatriot is kept at a distance by the staff and other customers until another person enters the building. Mighty Man approaches his fellow hero with a proposal of him joining the new Freak Force team. Due to his negative past experiences with teams, SuperPatriot initially turns down the offer. Mighty Man points out that this new group are former police officers and that they have no ties at all to the government. This starts to appeal to SuperPatriot and he begins to ask for more information….